The University of Limerick has this week issued a news release trumpeting its innovative device which it claims could revolutionise balloon angioplasty procedures. Its gizmo combines a new form of coiled balloon, which will permit continued blood flow during inflation, with a downstream filter to capture plaque debris. Angioplasty is a long-established technique for mechanically widening narrowed or obstructed blood vessels, generally 3-8mm in diameter. Typically balloons occlude the entire vessel during inflation and so the procedure involves multiple short-duration inflation/deflations to work. Even then there remains the risk that unstable plaque deposits on the vessel walls can break free and enter the blood stream and potentially block other arteries resulting in strokes or heart attacks. Consequently embolic protection devices are often used to capture and remove the dislodged fatty deposits. 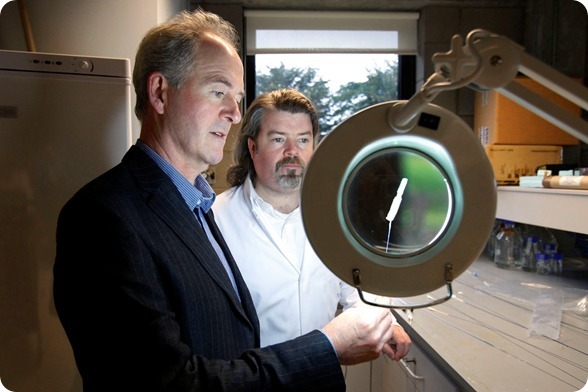 The new device, developed by Dr Michael Walsh, principal investigator and lead inventor(picture right), and colleagues at the University of Limerick, combines both balloon principles and filtration. The really innovative aspect though, is the dual-route flow it incorporates. Essentially there is a hole through the middle of the device that allows regular blood flow. Meanwhile the balloon stretches the walls of the artery, then immediately catches any resulting plaque break-offs in the filter. According to the developers this presents some distinct advantages over existing devices. Ultimately, Walsh believes it could improve the success rate of the more than one million angioplasty procedures undertaken worldwide each year. The technology has now been licensed to Galway-based medical devices company, Clada Medical, who hope to tap into the approximate €500m angioplasty market. Clada Medical is an Irish-owned company that provides medical device design, research and development, testing and OEM manufacturing services from its Class 8 clean-room facilities in Galway. The company has particular expertise in balloon mould manufacturing and custom balloon/catheter design.